Yes, it's true. I've got spool fever! 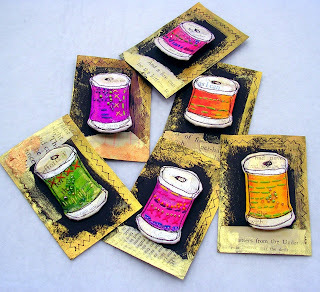 I'm in love with spools of thread. Here I've made some cute little wearable pins with embroidery and beading. They are pinned to cardstock for gift giving. 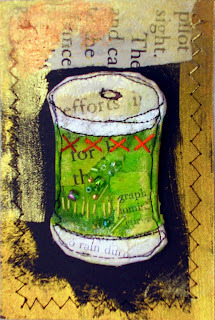 They are just muslin, collaged and stitched and painted, then mounted on stiff interfacing. Your spool book is adorable. What kind of dyes did you use for your dye pot day? I have never tried dying. I've since added glitter to the spools, will repost. I use Procion MX dyes purchased at Dharma Trading (online). These are cold water dyes for natural materials like cotton. Love 'em! these are fabulous, Kelli! Art, sewing , fabric dying all in one project, I love them!! And beads, gaaah!